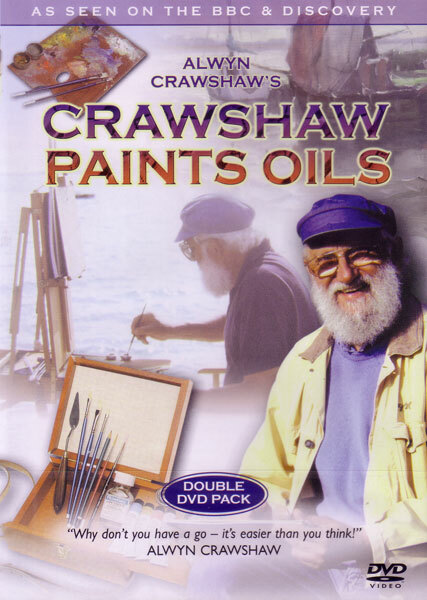 Alwyn Crawshaw introduces and demonstrates the techniques and equipment needed for successful oil painting. He strips away the mystique about painting in oils and shows how simple and enjoyable it can be. 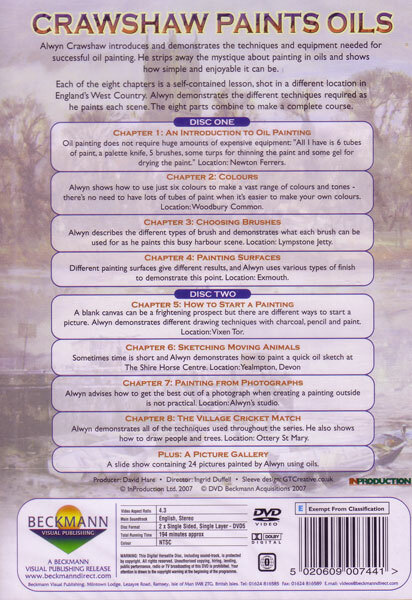 Each of the eight chapters is a self-contained lesson, show in a different location in England's West Country. Alwyn demonstrates the different techniques required as he paints each scene. The eight parts combine to make a complete course. Oil painting does not require huge amounts of expensive equipment: "All I have is six tubes of paint, a palette knife, five brushes, some turps for thinning the paint and some gel for drying the paint." Location: Newton Ferrers. Alwyn shows how to use just six colours to make a vast range of colours and tones - there's no need to have lots of tubes of paint when it's easier to make your own colours. Location: Woodbury Common. Alwyn describes the different types of brush and demonstrates what each brush can be used for as he paints this busy harbour scene. Location: Lympstone Jetty. Different painting surfaces give different results and Alwyn uses various types of finish to demonstrate this point. Location: Exmouth. A blank canvas can be a frightening prospect, but there are different ways to start a picture. Alwyn demonstrates different drawing techniques: charcoal, pencil and paint. Location: Vixen Tor. Often time is short and Alwyn demonstrates how to paint a quick oil sketch at The Shire Horse Centre. Location: Yealmpton, Devon. Alwyn advises how to get the best out of a photograph when creating a painting outside is not practical. Location: Alwyn's Studio. Alwyn demonstrates all of the techniques used throughout the series. He also shows us how to draw people and trees. Location: Ottery St Mary.